Levoatriocardinal vein (LACV) is characterized by an abnormal connection between pulmonary and systemic venous return. 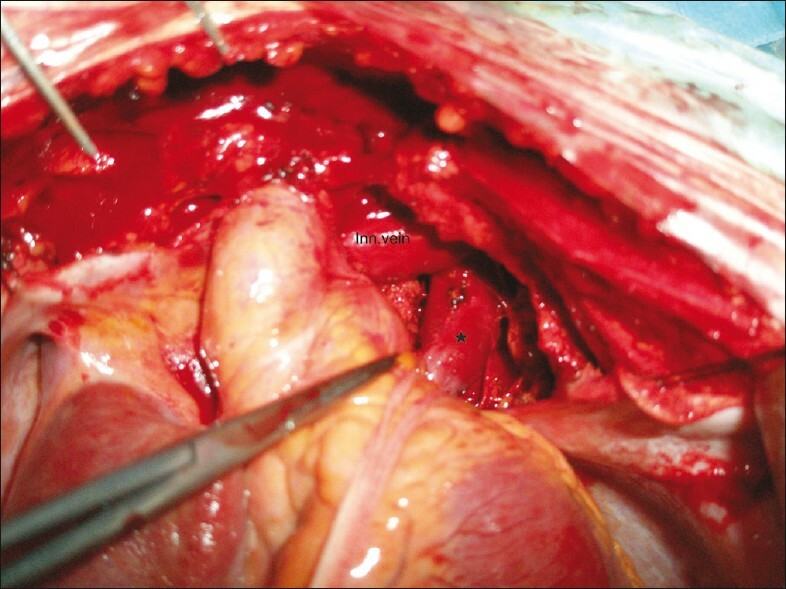 This extremely rare cardiac malformation is usually associated with left-sided obstructive lesions including mitral atresia, hypoplastic left-heart syndrome, and abnormal pulmonary venous connection. Patients may have low systemic cardiac output and pulmonary venous obstruction symptoms. In this manuscript, we report a case with LACV and normal pulmonary venous return with absence of any intracardiac pathology. LACV was demonstrated with echocardiography, angiography, and computed tomography. Surgical correction was made successfully. Clinically, the symptoms of pulmonary venous obstruction and low cardiac output  could be diagnosed within early infants. In this report, we describe a patient with late clinical presentation of LACV without pulmonary venous obstruction and additional cardiac malformation. A 24-year-old patient suffered from fatigue and palpitations during his military service. He was diagnosed with atrial septal defect and referred to our center for correction. In his physical exam, 2/6 heart murmur and fixed splitting of second heart sound was heard at the upper-left sternal border. Telecardiography revealed cardiomegaly and ECG was unremarkable except right-bundle branch block. Echocardiographic examination showed dilation of the right atrium, right ventricle, and main pulmonary artery. Apical four chambers and high parasternal views demonstrated an anomalous vein with an ascending course that was initially interpreted as an abnormal drainage of the left-sided pulmonary veins. Drainage of the right pulmonary veins to left atrium was normal and interatrial septum was intact. He was diagnosed to have an abnormal partial pulmonary venous connection with these features. In catheterization, all pulmonary veins were draining to the left-atrium. LACV was taking off from the left atrium, and was draining to the right-sided superior vena cava via the left brachiocephalic vein [Figure 1]. Qp/Qs was 2.8/1. Pulmonary artery pressure was normal and no gradient was detected between pulmonary veins and the left atrium. Angiograms showed no left sided obstruction at any level. 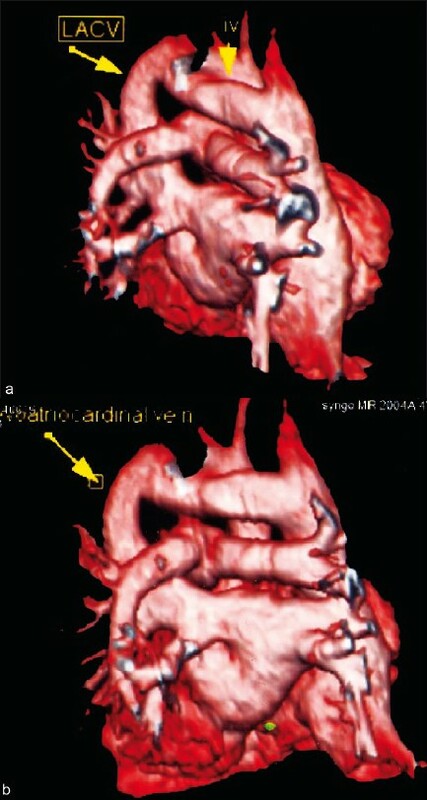 Magnetic resonance imaging showed a distinct LACV taking off from the left atrium and coursing into the right atrium. MRI also demonstrated normal return of pulmonary veins to the left atrium [Figure 2]a and b. Surgery was performed by a median sternotomy approach. 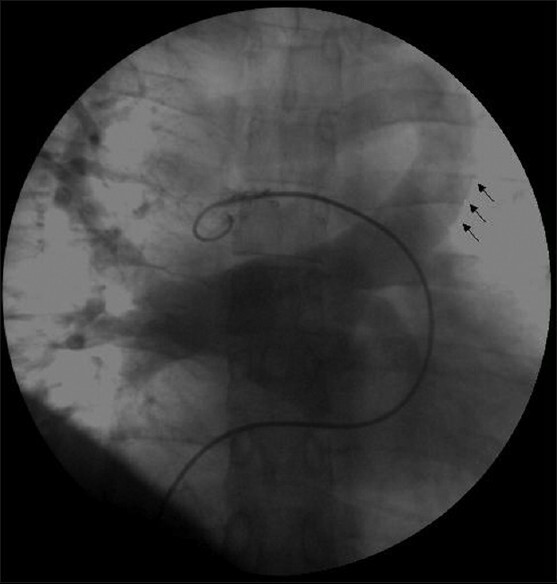 LACV was surgically ligated [Figure 3]. The patient was discharged at the sixth postoperative day without any complications. According to this theory, most of the cases with LACV have left-sided obstructive lesions. Only one case has been reported, concerning LACV without any intracardiac pathology and normal pulmonary venous connection. In practice this case is the second one concerning LACV without additional cardiac abnormality. Typical presentation can be found at the beginning of a person's life and is characterized by the symptoms of low cardiac output. Our case was with no symptoms shown until adulthood. Then, the patient suffered from fatigue and exertional dyspnea, which were related to chronic right heart volume overload mimicking atrial septal defect. Diagnosis of LACV can be made easily with echocardiography especially with existence of left-sided obstructive lesions. The LACV is seen on parasternal and suprasternal views as an abnormal ascending vertical venous image. Contrast injection into the left atrium or LACV during diagnostic cardiac catheterization is a reliable method for diagnosis. Magnetic resonance imaging and computerized tomography are other diagnostic methods to reveal anatomical details of pathology. Although transcatheter occlusion of LACV by some devices is possible without surgery, surgical ligation of LACV was made easily without cardiopulmonary bypass. In conclusion, LACV is an extremely rare cardiac pathology existing almost always with left-sided obstructive lesions. The diagnosis of LACV may be missed, when no intracardiac abnormality exists. Therefore, we recommend a detailed examination for the patients with right-heart volume overload, in the case of the absence of an atrial septal defect and an abnormal pulmonary venous connection, even when no left-sided obstructive lesion is present. 1. Mclntosh CA. Cor biatriatum triloculare. Am Heart J 1926;1:735-44. 2. Blieden LC, Schneeweiss A, Deutsch V, Neufeld HN. Anomalous venous connection from the left atrium to the cardinal venous system: "levoatriocardinal vein". AJR Am J Roentgenol 1977;129:937-8. 3. Bernstein HS, Moore P, Stanger P, Silverman NH. The levoatriocardinal vein: Morphology and echocardiographic identification of the pulmonary-systemic connection. J Am Coll Cardiol 1995;26:995-1001. 4. Amoretti F, Cerillo AG, Chiappino D. The levoatriocardinal vein. Pediatr Cardiol 2005;26:494-5. 5. Lee ML, Wang JK, Lue HC. Levoatriocardinal vein in mitral atresia mimicking obstructive total anomalous pulmonary venous connection. Int J Cardiol 1994;47:1-4. 6. Jaecklin T, Beghetti M, Didier D. Levoatriocardinal vein without cardiac malformation and normal pulmonary venous return. Heart 2003;89:1444. Cullen, E.L., Breen, J.F., Rihal, C.S., Simari, R.D., Ammash, N.M.